Let's clear this up, for all those who have caught the poorly produced trailers of Bridge To Terabithia - whatever you may have heard or seen, this is not a fantasy movie. While the trailers make it look like some sort of a Narnia/Eragon knock-off, this is definitely not a film with magical quests and dark prophecies or even sweeping grandeur. This is a film about a deep friendship between two gifted children, and an incredibly realistic portrayal of growing up while dealing with all the issues that children face: money crunch at home, stressed out parents, bullies, creative freedom, friendship, teacher crushes and loss. Jesse Aaron (Josh Hutcherson) is a middle-school boy who is gifted as an artist. Something he has picked up as habit is the ability to run really fast, as he is a child constantly trying to escape from the pressure of bullies and a family that demands too much of him. He is surrounded by his sisters, and his strained parents trying to keep their family afloat. Something that begins as a rivalry - new neighbor Leslie (AnnaSophia Robb), a free-spirited and full-of-life girl beats him at a boys only race - gradually develops into a lasting and effectual friendship. Leslie is a budding writer, too, and when she and Jesse start hanging out together, they discover their talents and build an imaginary world in a little patch of woods near their homes. They create a world that is free from the things that plague them outside, but gradually use it to learn new things about themselves and the world. When tragedy strikes, only the spirit of their friendship and the strength of their emotional bonds can see Jesse through it. What is most worth noting is how authentic the portrayal of middle-class America and the lives children lead is. The sisters who are a constant worry, the father who is overworked, the children who bully, they are all real characters who react to their environment. None of them feels like a cliché-ridden caricature. The attention to detail given to the cast and environment around the lead pair only adds to the incredibly real characters they themselves portray. While Jesse is the kind of boy who lowers his head and ignores everything around him, just so he gets through the day, Leslie is just Leslie, and if anyone does not agree with how she views life, she doesn't care, and doesn't seem to want to care. When they are drawn together as kindred spirits, you understand that how two people completely shunned by peers and family can bond. The kinship they begin to develop manifests itself in the make-believe world they create for themselves. That is where the Achilles' heel of the film lies. 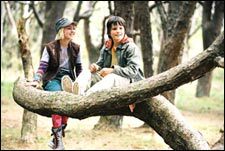 When the children start imagining that they are in the fantasy world of Terabithia, it manifests itself in the form of computer-generated imagery. This is a film that is strongly ensconced in reality and emotions, and the fantasy CGI world, however small the segment be, seems out of place and disconnected to the film. The film is based on a novel of the same name by Katherine Patterson, and while I haven't read it, it seems that screenwriters Jeff Stockwell and David Patterson (son of Katherine Patterson) have tried to create an honest film, but shoehorning the fantasy elements in a story that doesn't require it, smells of studio pressure. Director Gabor Csupo knows exactly what to do to keep the imperfectnesses of ordinary life interesting. Strangely, the helmer of animated features in his first live action feature struggles with the CGI bits. The main thrust of the film is the friendship between Leslie and Jesse, and the two child actors bring to the table a surprising maturity in the performance and understanding of the characters. The supporting cast leaves a great impact, and Csupo manages to direct them all in a clean, heartfelt way. Bridge to Terabithia is a touching and moving film, but the main reason people are going to turn up at the cinemas is the larger than life fantasy imagery that the promotions keep advertising, and that is bound to disappoint, as those are the least interesting parts of the film. Exorcise all the trickery and ignore the competently produced graphics, and this becomes necessary viewing if your family has a child between 10 to 18 years. Be the first to comment on Bridge To Terabithia (English)! Just use the simple form below. fullhyd.com has 700,000+ monthly visits. Tell Hyderabad what you feel about Bridge To Terabithia (English)!